Today’s blog post is courtesy of Dan. He was out this past weekend, taking advantage of the gorgeous weather to do some site scouting and other tasks related to his Frontenac Bird Studies projects. On this particular outing he was down at the now-retired third MAPS station, Hemlock Lake, which was north on the road where we used to live. Upon departing the site he discovered a turtle at the side of the road, and stopped to move it out of harm’s way. Judging from the nicks to its shell, it’s already been a little beat up. I wonder how much is just from scraping against rocks wherever it hibernated. 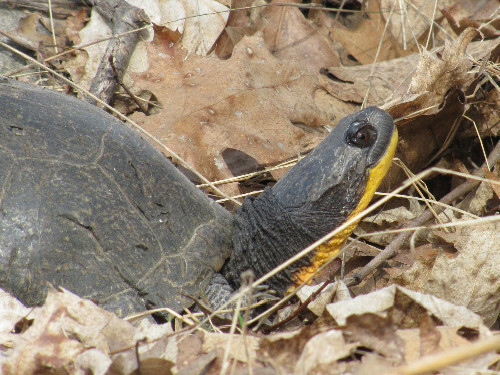 The bright yellow throat makes the identification easy: it’s a Blanding’s Turtle, Emydoidea blandingii. Although it’s not a rare species here in southern Ontario, it’s certainly uncommon. It’s also classified as Threatened, both provincially and nationally, as its populations are in decline. A large part of this is habitat loss, but also road mortality. 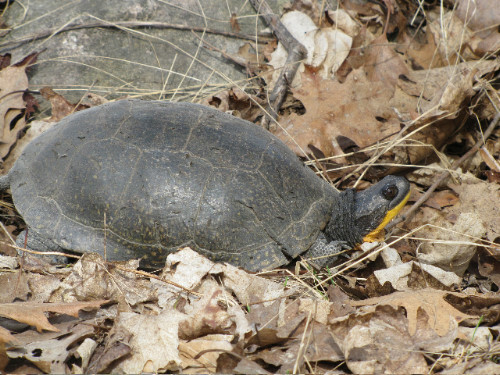 Blanding’s Turtles are highly mobile, by turtle standards, with the potential to travel as much as 7 km (4.3 mi) in search of food or a mate. One can imagine that such a journey would take them across many roads. Compounding the problem is that they don’t reach reproductive age until they’re 14 to 20 years old, or even as old as 25 years, and even once they start laying eggs, the small clutch size of only about 8 eggs, plus predation from raccoons, skunks and others, means only a small number of laid eggs ever make it to hatching (and an even smaller portion of those reach adulthood). 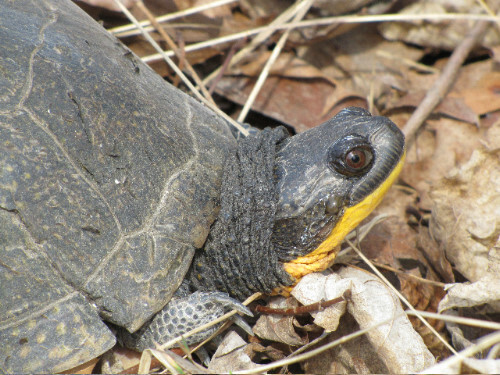 In ordinary circumstances, once it’s made it through the perilous first few years, a Blanding’s Turtle may live to reach 80 years old. This should be lots of time for at least one of its babies to reach sexual maturity, thus replacing itself and maintain a stable population. However, early mortality may mean the adults are killed before this can happen. Last summer, on my way back from running a few errands in town, I found a Blanding’s Turtle crossing our road. Naturally, I didn’t have my camera with me. I picked it up and moved it off the road, toward a wet bit there, and hoped it got where it was going. I was a bit surprised to find it in our area, but only because I tend to think of it as being a more southern species and we’re pushing the edge of the Shield here. Turns out it’s actually found quite a fair way north in the province. The above map is borrowed from the Ontario Herpetofaunal Summary Atlas, on the Ontario Ministry of Natural Resources’ website. Away from the shores of the Great Lakes, there seem to be definite areas of higher density – and the edge of the Shield, that transitional zone between St. Lawrence Lowland forest and Southern Shield which is sometimes labeled “The Land Between”, seems to be one of them. I’m not sure why this should be, but perhaps it relates to the area being rocky enough to be mostly undeveloped for farmland, but still containing many wetlands and water bodies. Like the terrestrial Box Turtle, the Blanding’s has the ability to close up its shell by way of a hinged portion of its plastron (the belly of the shell), although it doesn’t close as tightly as the Box Turtle can. Wikipedia suggests that the species is fairly timid, but the ones I’ve encountered have all seemed just as bold as the Painted Turtles; I’ve never seen a Blanding’s close its shell right up (but then, my sample size is quite small). I was a little surprised to hear Dan had encountered one so early; I only saw my first turtle (a Painted) this weekend at my parents’. However, they start emerging in early April and mate from mid-April to early May, so I’ll have to be on the lookout for them. I just love turtles. Pity I am out in Alberta where which seems to have no resident chelonians, outside of occasional sitings of Western Painted turtles in the Milk River, way down south. Oh, I like the yellow. Makes for a distinctive and intriguing turtle. It’s unfortunate that the species is threatened pretty much throughout its range.